Demak regency is one of goverment institute which act to make and accompany all section of agriculture and fishery in Demak and arround. Now, facilities and infrastructures in delivery information of agriculture and fishery's product which available are still simple and konventional. The aim of this research is to give solution which be related to information system and promotion, among others yields information, location of agriculture and fishery centers which can be delivered to investor who want to join investment even purchases agricultural and fishery products with maximum and fast. This research method using model approach Research and Development (R&D) in 6 stages, that are research and information collecting, planning, develop premilinary form of product, preliminary field testing, main product revision, and main field testing. The result of this study show that the using of android based mapping information systems has met the needs of farmers and investors in conveying information. Among others informations of investment even for purchasing agricultural and fishery products easily by smartphone based android in order to information can be delivered to potential buyers / investors. Manajemen Informatika, Aplikasi Manajemen, Android, Sistem Informasi. Borg, Walter R., & Gall, M.D. (1983). Educational research: An introduction (4ed). New York & London: Longman. Febryantahanuji. (2017). “Kesesuaian Jenis Tanah Terhadap Tanaman Untuk Meningkatkan Produktivitas Bisnis Hasil Perkebunan Dengan Geoprocessing”. Jurnal Teknologi Informasi dan Komunikasi. ISSN: 2598-9707.STMIK PROVISI: Semarang. Randy Dimas. (2013). Jurnal Skripsi “Pemetaan Digital Lokasi Sentra Industri di Kabupaten Jepara pada Platform Android”. Ejurnal Universitas Dian Nuswantoro : Semarang. Riyanto. (2010). “Sistem Informasi Geografis Berbasis Mobile”. Gava Media: Yogyakarta. Stollberg, Beate. Alexander Zipf. (2008). “Geoprocessing Services for Spatial Decision Support in the Domain of Housing Market Analyses”. AGILE International Conference on Geographic Information Science. University of Bonn: Germany. ROHMAN, M Aguts; FEBRYANTAHANUJI, Febryantahanuji; MUSTOFA, Zaenal. PEMETAAN DIGITAL LOKASI SENTRA PERTANIAN DAN PERIKANAN UNTUK MENARIK MINAT INVESTOR PADA KABUPATEN DEMAK KOTA DENGAN PLATFORM ANDROID. 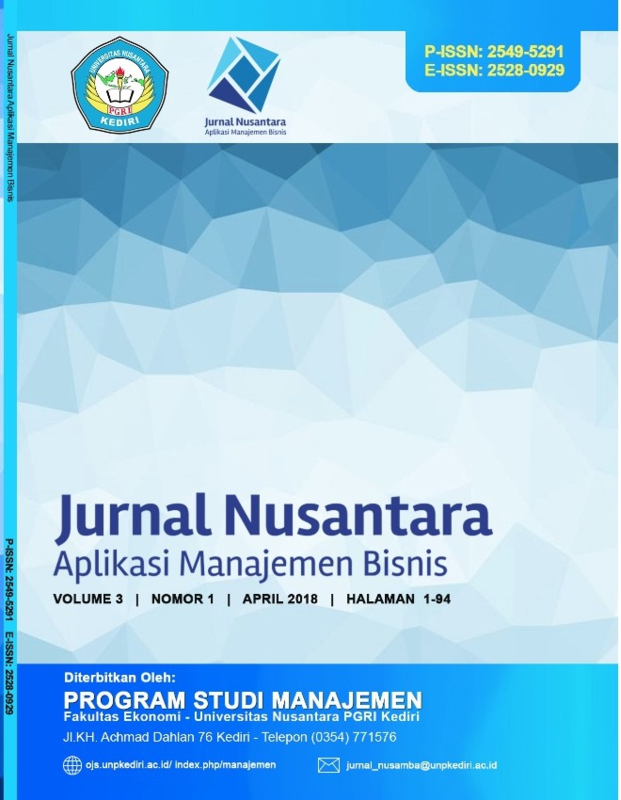 JURNAL NUSANTARA APLIKASI MANAJEMEN BISNIS, [S.l. ], v. 3, n. 1, p. 43-53, apr. 2018. ISSN 2528-0929. Available at: <http://ojs.unpkediri.ac.id/index.php/manajemen/article/view/12028>. Date accessed: 25 apr. 2019. doi: https://doi.org/10.29407/nusamba.v3i1.12028.